One of the greatest conflicts in the world today is the one that exists between Jews and Arabs. If the Gospel is truly “the power of God unto salvation” then it must contain the divine wisdom and empowerment necessary to transform this seemingly hopeless situation. I personally experienced this power several years ago in Detroit. There were 30,000 people worshiping and praying at Ford Field. After sharing a message about the importance of uniting Jews and Gentiles in Messiah, an Arab brother, who initially came to the U.S. as terrorist but became a follower of Jesus, spontaneously got down on one knee and asked forgiveness for his past hatred of the Jewish people. I also got down on my knees, and there was a powerful moment of reconciliation. The Presence and power of God could be tangibly felt as thousands wept at the sight of Isaac and Ishmael being reunited in Yeshua (Jesus)! People were deeply touched by the Lord through this moment of reconciliation and unity. One young women approached me saying, “My Lebanese grandparents were killed by Israeli soldiers and I have always hated the Jewish people—but I was so touched by what I saw happen with you last night that I want you to pray for me. Please pray that the Lord would help me to forgive and love the Jewish people.” The Lord did not just transform her heart but mine as well. God birthed a love in my heart for the Arab and Muslim world and a desire to share the love of Messiah with them. In that moment, I knew that what the Lord did in Detroit was something that He wanted to do on a global level. God has sovereignly made this dream a reality! Al Chayat TV was founded by Joyce Meyers but is now run by Key Media out of Finland. The network has 100,000,000 Arab viewers and has had over 12 million responses to their programming. They broadcast to 85% of the Muslim world in Arabic, and they have asked me to be the first Messianic Jewish leader to have a show on their station. Al Chayat’s director, an Israeli Arab, believes that this show is going to have a huge impact for Messiah. 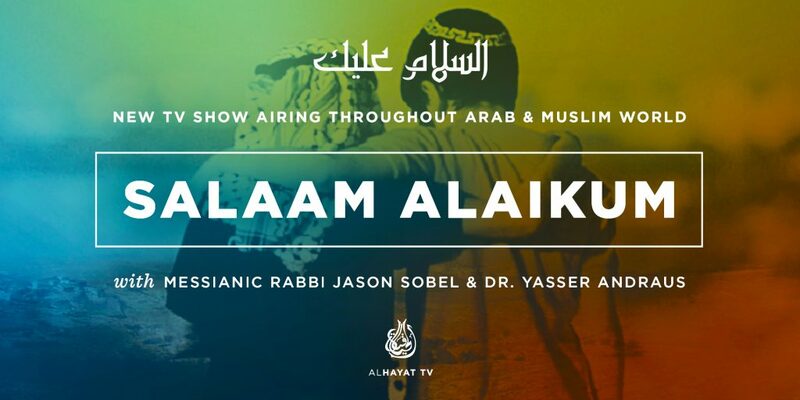 We have filmed 26 half-hour episodes of an TV show entitled Salaam Alaikum, which is Arabic for ‘Peace to You’. The show has recently begun to air in both Arabic and in English (with Finnish subtitles in Finland). I co-host the show with Dr. Yassir Andraus, who grew up as radical Muslim in Africa but had a life changing encounter with Yeshua that totally changed his heart and gave him a love for the Jewish people. Salaam Alaikum seeks to answer and explain the connection between the Old Testament and New Testament, and answers key questions commonly asked by Muslims, Muslim Background Believers, and Arab Christians such as: Is Mohammed prophesied in the Old Testament? Is the Trinity Biblical? Is God really one? Why was Jesus death on the cross necessary? Are the Old and New Testament manuscripts? Has the Church replaced Israel? This unity is powerfully demonstrated when these two groups partner together to proclaim to the world that Jesus/Yeshua is the Messiah. Today in the Arab World there is an unprecedented number of Muslims that are turning to faith in Messiah as a result of being turned off by radical Islam. The biggest opportunity in the world right now is for Arab Muslims to encounter the love of God though Messiah.